The Japanese art of Shibori is a method of dyeing, in which the cloth is bound, stitched, twisted or folded to create patterns. Modern interpretations of this process were seen on the runways, often in rich indigo hues. Diane Von Furstenburg’s mixed media version of modern Shibori. Tory Burch showed a more ethnic take on the technique. Surface to Air kept it pure, with indigo motifs on a clean, white ground. Just Cavalli mixed traditional Shibori with contemporary patching. 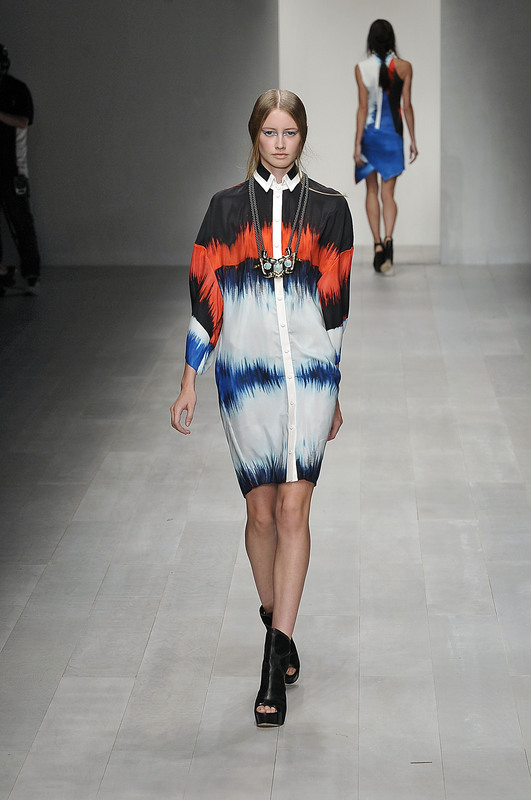 Band of Outsiders featured dip dyed techniques as well as fabric manipulated dyeing to achieve rich pattern work. This entry was posted on January 7, 2013 at 7:59 am and is filed under fashion. You can follow any responses to this entry through the RSS 2.0 feed. You can leave a response, or trackback from your own site.